The Indigenous Rights Center hosted a community dialogue called: “Connecting Indigenous Struggles and the Black Lives Matter Movement” on Aug 7, 2015. 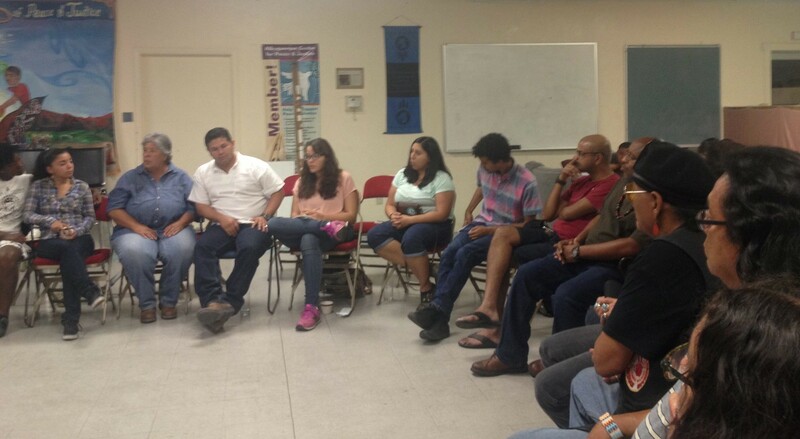 Indigenous rights activist Aureliano Molina and three activists with the Black Lives Matter Los Angeles chapter discussed the state of African and Indigenous resistance in the Americas, especially in Molina’s home of Honduras. Molina is an organizer with the Civic Council of Indigenous and Popular Organizations of Honduras (COPINH). His organization is 22 years old and works directly with the Lenca indigenous peoples and the eight other indigenous nations in Honduras, including the Garifuna, an Afro-Indigenous nation. COPINHorganizes in 200+ communities for territorial and ancestral rights. They have fought against Canadian mining companies, hydroelectric dam projects, and U.S. military base construction on their ancestral lands. Molina is part of COPINH’s executive council. The group is part of a delegation to Mexico, Guatemala, Honduras, and Belize to exchange with Black and Indigenous communities organizing for autonomy and self-determination. They shared testimonies of their exchanges with African and Indigenous communities in Central America resisting imperialism and genocide, and their connection to local Black and Brown resistance. Sayrah Namaste, a volunteer with the Indigenous Rights Center, met Todd Griffin of the Black Lives Matter Los Angeles chapter during a sunrise ceremony and blessing at La Plazita Institute in Albuquerque. They talked about the connection between indigenous struggles and the Black Lives Matter movement, and Todd asked if he could return to Albuquerque with Molina, who was heading home the following week. Sayrah asked the Indigenous Rights Center to host this historic conversation and (Un)Occupy Albuquerque offered to help with a potluck dinner before the event. Amalia Montoya, a Native American activist with (Un)Occupy Abq facilitated the dialogue. The turnout was far greater than expected since the event was organized on short notice, with more than 30 people participating. The Indigenous Rights Center was a great partner in this important event.